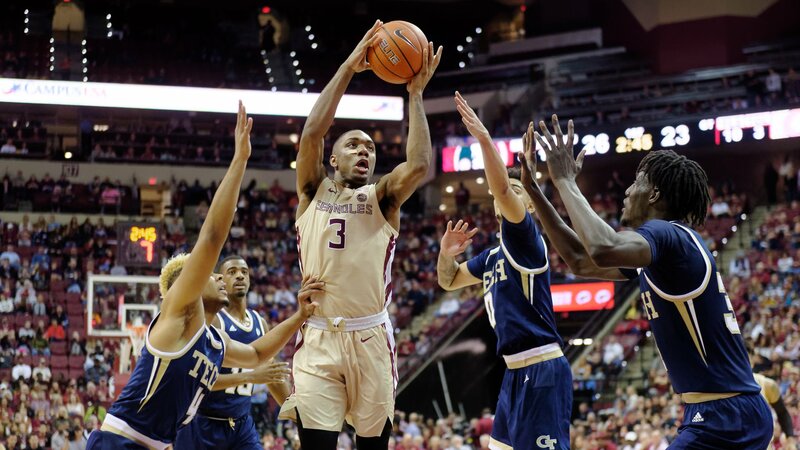 Florida State stayed red hot on Tuesday night, capturing an impressive 80-62 win at Syracuse. The Seminoles have won four straight and now sit at 17-5 overall and 5-4 in ACC play. This week, we added a bracket from the Washington Post. All bracket projections were published prior to Tuesday’s win at the Carrier Dome. Prior to that, FSU topped Georgia Tech at home, 59-49, over the weekend. The two “bracketologists” who had FSU seeded the highest this week both put the Seminoles as a No. 6 seed in the Midwest Region. NBC Sports’ Dave Ommen has FSU facing No. 11 seed and projected Big South champion Wofford in Hartford. The Terriers are 2-0 all-time vs. FSU, but the teams have not met since 1949. CBS Sports’ Jerry Palm has FSU facing the winner of a First Four match-up between Seton Hall and Alabama. FSU is 8-8 all-time against the Crimson Tide with the last meeting being a victory in the 2009 Old Spice Classic at Disney. Prior to that, the teams had not met since 1986. FSU is 3-1 all-time against Seton Hall with two wins coming on neutral courts, but the Pirates won the last meeting in Tallahassee in 1999. SB Nation’s Chris Dobbertean also sees an FSU-Alabama showdown in the round of 64 as a possibility, but this time in the 7/10 match-up in the South Region. Patrick Stevens of the Washington Post also has Florida State as the No. 7 seed in the South Region, but against Indiana in Jacksonville. The Hoosiers are 4-0 all-time against FSU with two of those contests coming in the NCAA Tournament. The last meeting was an overtime win for Indiana in the 1992 Preseason NIT at Madison Square Garden — eight months after the Hoosiers topped FSU in the Sweet 16. Like Stevens, ESPN’s Joe Lunardi has Florida State playing as a No. 7 seed in Jacksonville, but in the East Region against Texas. FSU is 2-0 all-time in that series, but the teams haven’t met since Feb. 1, 1970. After a big road win on Tuesday night, FSU returns home to face No. 16 Louisville on Saturday. Lunardi currently has Louisville listed as a No. 3 seed. All others have the Cardinals as a No. 4.